Artemisia – Artemisia x. ‘Powis Castle’ (24 – 36 inches) Gray, finely divided foliage, very aromatic. Prefers full sun and well drained soil. Autumn Sage – Salvia greggii (36 inches) Gray, finely divided foliage, very aromatic. Prefers full sun and well drained soil. Butterfly Bush – Buddleia davidii (36 – 48 inches) Blooms in summer, flower color depends on selection – purple, red, white, pink, blue, and yellow. Full sun or light shade. Regular to moderate water, excellent drainage is a must. ‘Black Knight’ is an excellent purple color. Calylophus – Calylophus drummondianus (12 – 18 inches) Native Blooms March – November. Yellow flowers (2″ wide). Mature flowers turn orange. Prefers full sun and well drained soil. Excellent mass in hot dry beds. Spreads by underground rhizomes. Plants are dormant in winter. Canna – Canna x. generalis (36 – 72 inches) Large green to bronzy red leaves with spikes of large, irregularly shaped flowers. Blooms from summer to fall with mixed colors. Prefers full sun, ample water during growth and bloom. Needs moist, well-drained soil. Catmint – Nepta x faassenii ‘Six Hills’ (10 – 12 inches) Silvery gray foliage with light blue flowers. Blooms spring through fall. Prefers full sun, well-drained soil. Daylily – Hemerocallis sp. (12 – 36 inches) Blooms in summer with mixed colors. Few plants are tougher or more trouble free than daylilies. They adapt to almost any kind of soil. They can be evergreen, semi-evergreen, or deciduous depending on type. Grow in full sun or light shade. Flame Acanthus – Anisacanthus quadrifidus v. wrightii (24 – 36 inches) Plant grows 2-3 ft. tall with red-orange flowers from June – October. Attracts hummingbirds. Prefers sunny locations, but it will also bloom in shady areas. Tolerates dry soil. Gaura – Gaura lindheimeri (36 – 48 inches) Small pink and white flowers bloom from spring to fall. Long bloom period with only a few blossoms opening at a time. Prefers full sun or partial shade. Very drought tolerant, prefers unfertilized, well-drained soil. Iris, Bearded – Iris sp. (24 inches) Needs good drainage. They will grow in soils from sandy to clay-like, but in clay soils plant in raised beds or on ridges. Plant in full sun or partial shade. July-October best planting time. Bloom in spring. Louisiana iris is suited for poorly drained soil or average dry areas. Evergreen. Iris, Lousiana – Iris sp. (24 inches) Needs good drainage. They will grow in soils from sandy to clay-like, but in clay soils plant in raised beds or on ridges. Plant in full sun or partial shade. July-October best planting time. Bloom in spring. Louisiana iris is suited for poorly drained soil or average dry areas. Evergreen. Mealy Cup Sage – Salvia farinacea (36 inches) Fast growing with grayish green leaves. Blooms spikes of small blue flowers that rise above foliage mound in summer. Plants are perennials where winter temperature remains above 10 degrees F. Dwarf varieties are ‘Mina’ and ‘Victoria’. Mexican Bush Sage – Salvia leucantha (36 – 48 inches) Native Grayish green foliage with long velvety purple spikes set with small white flowers arch outward in summer and fall. Takes some drought. May be harder if old stems are not cut back until spring. Tolerates sun and partial shade. Needs well drained soil. Moonbeam Coreopsis – Coreopsis verticulata ‘Moonbeam’ (18 inches) Native Lemon-yellow daisy flowers with dark green, airy thin leaves. Blooms June until frost. Does well in full sun or light shade. ‘Nana’ a broadleaf variety (10 – 12 inches). Needs well-drained soil. Oxeye Daisy – Chrysanthemum leucanthemum (18 – 36 inches) Blooms March to June with classic white daisies with yellow centers. Grow in sun to partial shade. Needs well-drained soil. 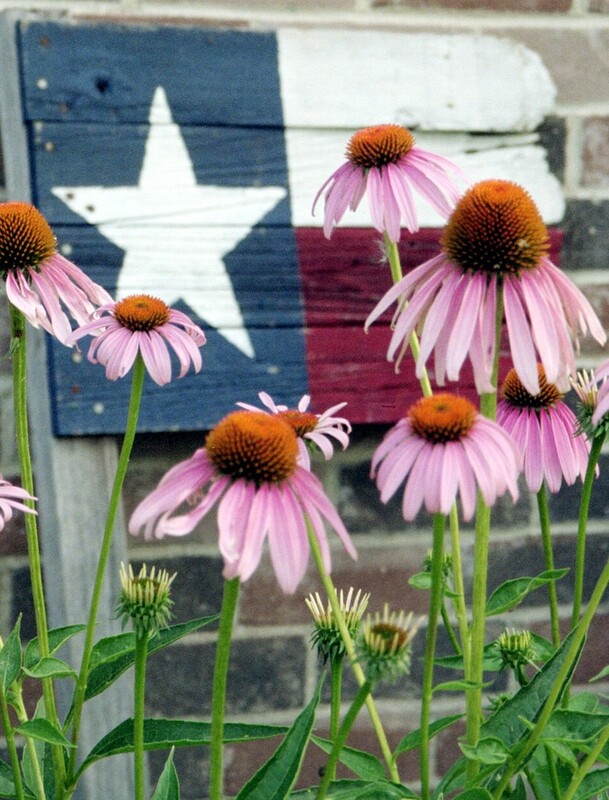 Purple Coneflower – Echinacea purpurea (24 – 36 inches) Native Rose-purple, daisy like blooms with dark cones. Blooms from May to September. Attracts butterflies. Grows in full sun and partial shade. Also available in white. Prefers well-drained soil. Russian Sage – Perovskia atriplicifolia (36 – 42 inches) Silvery foliage with outstanding mass color, fragrance. Blooms violet – blue flowers from June to October. Prefers full sun, needs moderate water and tolerates drought. Salvia – Salvia farinacea x longispicata, ‘Indigo Spires’ (36 – 48 inches) This fast growing plant with light green foliage has a mass of dark purple blooms. Starts blooming in early summer and continues until freeze. It needs a moist well-drained soil in a sunny or partial shade location. Sedum – Sedum sp. (0 inches) Very diverse species that include many groundcovers (‘S. acre’, ‘Dragons Blood’, and ‘Tricolor’). All sedums bloom in late summer or early fall. All add texture interest with their unique and colorful succulent foliage. Very hardy and evergreen, drought tolerant. Prefers full sun or light shade. Favorites include ‘Autumn Joy’ (bright pink flowers 2-3 ft.), ‘Vera Jameson’ (purple leaves and light pink flowers), ‘Mohrchen’ (burgundy leaves and red flowers). Soapwort – Saponaria officinalis (24 inches) Spreads by underground runners that can be invasive in rich moist soil. Blooms in summer in loose clusters in red, pink, or white flowers. Tough plant. Texas Aster – Aster oblongifolius (24 – 36 inches) Native Lavender blooms from September to November. Excellent drought tolerance. Prefers a sunny, well-drained location, but will flower in partial shade. Veronica – Veronica sp. (18 – 24 inches) One of the most trouble-free, long-blooming perennial. Lush, uniform, mound-shaped plants are covered with long flower spikes and rich, dark green foliage. Bloom from April to frost in full sun or light shade. ‘Sunny Border’ is a favorite. ‘Red Fox’ (rosy pink), ‘Icicle’ (white) and ‘Blue Charm’ (light blue) are also excellent. Wild Petunia – Ruellia sp. (10 – 36 inches) All have crinkly purple / lavender flowers that resemble petunias. Good plant for troublesome shade areas as well as full sun. Blooms April to November. Can be invasive. ‘Katie’s Dwarf’ is well behaved. Requires regular to moderate water and well drained soil. Winecups – Callirhoe involucrata (12 inches) Native A low growing, early spring bloomer. Blooms from February to June with wine-red flowers. Good as front border or cascading over a wall. Generally goes dormant in July if not given extra water. Requires sun to partial shade and well drained soil. Yarrow – Achillea sp. (12 – 24 inches) Upright, lacy foliage with flat topped clusters of flowers. Colors of hybrids include white, rose, pink, red and yellow. Some have silvery gray foliage. Blooms early spring to summer. Prefers full sun and well drained soil.